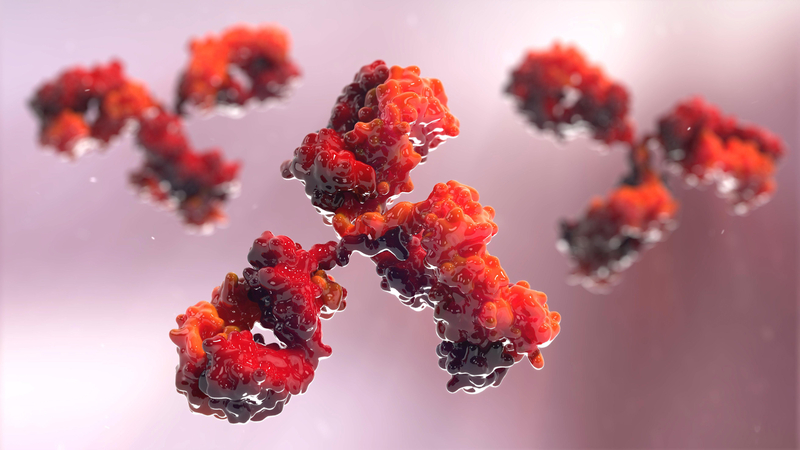 Antibody is an immunoglobulin produced by the body’s immune system and stimulated by antigen to proliferate and differentiate from B lymphocytes or memory cells and specifically bind to the corresponding antigen. So what are the major biological functions of antibodies? Antibody hypervariable region and antigenic determinants of the three-dimensional structure must be consistent in order to bind the antibody and the antigen binding is highly specific. Antibody molecules that specifically bind antigen can mediate a variety of physiological and pathological effects in vivo. Antibody and antigen binding by non-covalent bond is reversible, and electrolyte concentration, PH, temperature and the integrity of the antibody structure can affect the ability of antibodies and antigen binding. The binding valence of IgG is bivalent; the binding valence of IgM is theoretically deca-valent but is practically pentavalent due to steric hindrance; and the dimeric IgA is tetravalent. When the IgG1, IgG2, IgG3 and IgM antibody molecules specifically bind to the corresponding antigen, their conformation changes. The complement of the complement binding site, CH2 of IgM or CH2 of IgG is bound to Clq and the complement system is activated by the traditional pathway. For IgG, at least two closely adjacent IgG molecules are needed to activate complement when they are bound to the corresponding antigen. Aggregates of other Ig molecules, such as IgG4 and IgA, activate complement by alternative pathways. Human natural anti-A and anti-B blood group antibody is IgM, and when blood group does not meet the blood transfusion, the antigen-antibody reaction activates complement hemolysis, causing rapid and serious transfusion reactions. After binding the corresponding antigen through the V region, Ig can bind trough Fc segment to a variety of cell surface Fc receptors, and stimulate different effector functions. IgG molecules binds to bacteria and other particulate antigen, then pass through the Fc segment and mononuclear phagocytes and neutrophils corresponding receptors (FcγR), and thus promotes its phagocytosis called opsonization. Complement and antibody play the role of conditioning phagocytosis, known as the joint conditioning effect. Neutrophils, monocytes and macrophages have high affinity or low affinity for FcγRI (CD64) and FcrRII (CD32), and IgG, particularly human IgGl and IgG3 subclasses, plays major roles in opsonophagocytosis. Eosinophils have affinity FcyRII, and IgE and the corresponding antigen can promote phagocytosis of eosinophils. Fc fragments of IgE, upon binding to the corresponding receptors on the surface of mast cells and basophils (FcεR), sensitize these cells and under the action of allergens, degranulate these cells to release bioactive substances such as Histamine, bradykinin, causing local telangiectasia, increased permeability, stimulate type I hypersensitivity. IgG binds to corresponding target cells, such as virus-infected cells and tumor cells, and exerts an ADCC effect by binding its Fc fragment to the corresponding receptor (FcγR) on NK cells. Mononuclear phagocytes and neutrophils, which have IgG Fc receptors on the surface, also produce ADCC effects on target cells that bind to IgG as described above. Among the five types of Ig, IgG is the only Ig that can be transferred from the mother to the fetus through the placenta, and the immunity obtained by the fetus in this manner is called natural passive immunity. Studies have shown that maternal IgG may be transported to the fetus by binding to the corresponding receptor on the surface of the placental trophoblast—FcγR. Antibodies have a positive and a negative regulatory effect on immune response, and through the unique and anti-unique type of network involve in the body’s immune regulation. The above briefly described the five biological functions of antibodies, which are a specific function with the antigen, activation of complement, binding of Fc receptors and transplacental and immunoregulation. Resulting from a single B cell clone, monoclonal antibody is highly uniform and only binds to specific antigenic epitopes; and polyclonal antibodies are hybrid antibodies that stimulate various types of monoclonal antibodies produced by various epitopes. All of these antibodies have the basic biological function of antibodies and are widely used in many types of research and diagnosis.